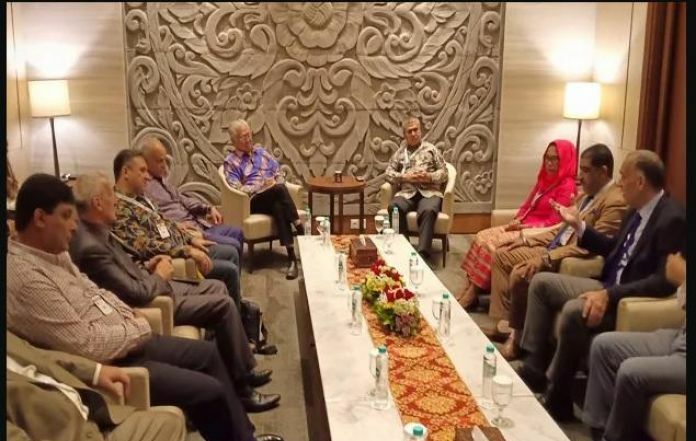 BANTEN, Indonesia – 1 November 2018: Indonesian Minister of Trade and Industry Enggartiasto Lukita stated that his country will sign with Egypt two agreements to increase the trade volume between the two countries by at least 300 percent. “Our ambassador is already doing the preparations and contacts with the Egyptian government. And we propose starting with PTA (Preferential Trade agreement),” Lukita told Egyptian reporters on the sidelines of the 33rd Trade Expo Indonesia (TEI) 2018 at the Indonesian Convention Exhibition in BSD City in Banten. A Free Trade Agreement (FTA) is the second deal that both sides are negotiating, the minister added. Lukita revealed that he will pay Egypt a visit in 2019 to finalize the two agreements, saying "in less than six months, we are going to finalize the agreements." As for the strained Indonesian-Australian relations, Lukita said that he met with the chief minister of the Northern Territory of Australia to discuss this issue. Australia announced moving its embassy from Tel Aviv to Jerusalem. Consequently, Indonesia threatened to hold on an imminent deal with Australia, announcing that the decision could strain the bilateral relations. Trade volume between Egypt and Indonesia reached $203 million in 2018, compared to $75 million in 2017 with an increase of 169.65 percent, according to Egypt’s Central Agency for Public Mobilization and Statistics (CAPMAS), said Indonesian Ambassador to Cairo Helmy Fawzy during the National Day of Indonesia on October 1. From January to June 2018 the trade volume increased by $561 million (12 percent), compared to the same period of 2017, according to CAPMAS. The minister and the Indonesian ambassador to Egypt held a joint meeting with Egyptian importers and pledged to provide the Egyptian market with the Indonesian Rubosta coffee, following a complaint from the Egyptian importers over insufficient exported amount, although the importation rate of coffee increased by 10 percent in 2018. Also, on the sidelines of TEI 2018, a $30 million deal was signed between Egyptian Haggag Company and its partners (Al-Nada, Kenouz al-Bon and Zahret al-Bon al Brazili) and Indonesian PT Asal Jaya to import coffee. Egypt imports 40 tons of coffee beans annually to meet the local market’s needs. However, the imported quantity increased to 45 tons by 10 percent in 2018. Seventy percent of coffee comes from Indonesia due to its cheap prices and high quality, Chairman of the Coffee Division in Egypt’s Chamber of Commerce Hassan Fawzy said in a statement in June 2018. Egypt imported coffee worth $48.151 million in the period between January and July 2017, compared to $7.287 million in the same period of the previous year, with an increase of 560.8 percent, according to the state-owned Central Agency for Public Mobilization and Statistics (CAPMAS). The joint business meeting was attended by prominent Egyptian businessmen in the fields of coffee, tires, and palm oil. Several Egyptian businessmen received the Primaduta Award, which is an Indonesian program that aims to increase the growth of Indonesian exports worldwide. Egypt comes in the first place among the countries that were granted Primaduta Awards, while Holland comes in the second rank. Saudi Arabia and China came third, where three awards will go for three companies. Egypt ranked number four among the top five countries that signed trade contracts with Indonesia in 2018, the minister added.